2-Day Turnaround! We print books in 48 Hours Guaranteed. Hard-cover books and Coil bound books in 5 days. Great Customer Service! Heck, we even answer our phones! Really, give us a call ... 800-231-0521. Easy Ordering! Simple, quick step-by-step ordering. We offer self-help book templates, structure advice, and publishing from beginning to end. But if you have any questions, just give our self-help book publishers a call. We're here to help. Prices as low as $2.50 per book. 25 Free books on orders of 100 or more! You can order as few as 10 books, but most of our authors order at least 100 so they get their 25 free. Last year, we gave away over 98,000 free books, and we'll give away even more than that this year! So click the big red "Instant Pricing" button on the right to get prices, and then place your order and get your share of free books. Are you writing a Self-Help book? Here are some tips from 48 Hour Books to help you through the process. Tone of voice: There should be a specific tone to your writing style that the reader can easily pick up on. Use conversational language to engage the reader and make them feel like they are building a relationship with you. First and foremost, you need to establish yourself as an expert and earn their trust. Stories: You want to be able to empathize with your readers while also providing guidance. Tell stories that relate to the issue you are addressing. They can be highly personal stories that happened to you or to a loved one, or they can be hypothetical characters and events. The purpose is to illustrate a point in the clearest possible way. Encourage the reader throughout the book. 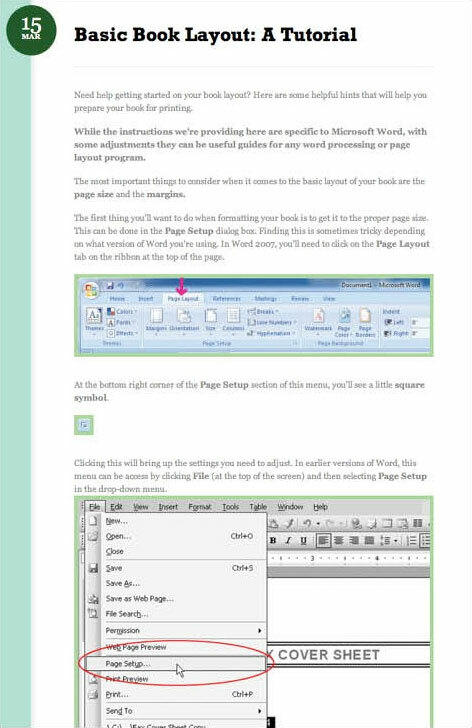 One great method to use is recapping each paragraph, and giving the reader a quick glimpse into the next chapter. Show them what they've accomplished so far, and what lies ahead. This will not only keep your reader focused on their goals, but it will also motivate them to keep going. Structure and Content: There are a lot of different elements that can be included in a Self-Help book, so it is important to organize your book so that it is clear and concise. It is best to keep the format of each chapter or section the same throughout the book. For example, you might decide to begin each chapter with a specific topic, then provide a story or anecdote to go with the topic, followed by bulleted lists of information and exercises. Once you establish the order, try not to deviate from that order throughout the book. Lists: Self-Help books are meant to be instructional, so bulleted or numbered lists are great to include. They can help make material clear and concise, make it look less intimidating on the page, and make it more easily digestible by the reader. Exercises: Make your book interactive. The reader wants to feel like they are accomplishing something by reading your book. Help them to feel like they are making progress. Include exercises or a workbook with activities at the end of each chapter or section that the reader can do. This can come in the form of a checklist with activities to do that week, or questions the reader must answer and evaluate. If you plan on having sections where the reader is meant to write in your book, consider using a heavier paper type, such as our 70# White Offset paper, as opposed to the standard 60# White Offset paper. Research: Research the issue you are writing about and provide references to your findings in your book. This will enhance your credibility and shows that you are an expert on the subject. If you've written (or are writing) a book, we also make it easy to Self Publish, with help from start to finish. 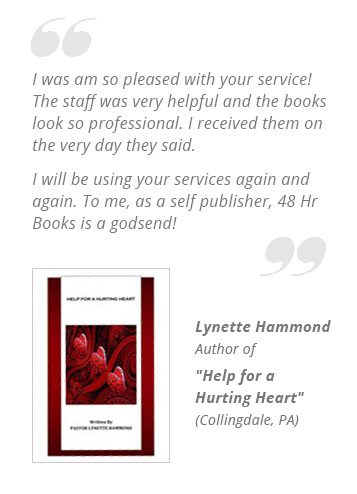 48 Hr Books' self-help book publishers have helped thousands of people just like you. We've got lots of helpful information on our website about how to print a self-help book, you can also just give us a call. We're happy to answer all of your questions over the phone. Whether you're new to Self Publishing, or you're an expert Self Publisher with several titles already in print, we can help get your books printed fast. We encourage all of our authors to do as much themselves as they can. From layout and formatting to PDF conversion, we can help you to do it yourself, which will save lots of time and money. We're always available to answer any questions you may have, and if you'd rather just give us your raw Word files and have us do the formatting and PDF conversion for you, we're happy to do that, too. We can help you to design your book, from the size of your pages to what fonts to choose for your chapter heads. And we can help with the layout of your cover, too. Our Create-a-Cover is an inexpensive option that lets you select the basic look of your cover. Then you upload whatever photos or artwork you'd like included, and we'll put everything together to make a professional book cover at a fraction of the cost. Are You Already a Self Publishing Expert? Maybe you've already been through the process of design, layout, file preparation, final proofreading, and printing your book. If that's the case, you probably won't need most of the extra help that we've got to offer. But we're still the FASTEST book printers in the world. And with unique capabilities that many of our competitors can't offer (like case binding, coil binding, full-color printing and combo books - books with a combination of some black-and-white pages and some full-color pages), we've got a lot to offer the seasoned self publishing expert. You may not need our help most of the time, but it's nice to know we're still here for you if you run into trouble with something. We've got a great group of customer service people, so call us today, and we'll be happy to help you in any way we can. Perfect Bound books are great for most orders because they keep the cost down, but still hold up very well over time. At 48 Hr Books, our STANDARD turnaround for Perfect Bound books is just 2 business days. Nobody else in the world offers that as their standard turn-around. And if that's still not quite fast enough for you, we even have Rush and SuperRush options available. You might also choose Coil Binding, especially if you have worksheets or activity pages that you want your readers to write on. And of course, Hard Cover (case binding) is also available. Both Coil and Hard Cover take 5 days to produce. The cover is the first thing the reader sees, so you want to make sure that it catches their attention. Choose an interesting graphic or font. At 48 Hr Books, all of our covers are printed in full-color at no extra charge, so liven your cover up with some color! Come up with a good cover that is not only eye-catching, but also conveys the purpose of your book quickly and easily. A potential buyer may only have a couple of seconds to glance at your cover ... make sure can tell immediately what your book offers. If you can, include some testimonials on the back of your book from people who have read. This will demonstrate your book's effectiveness, enhance your credibility and prompt more people to buy it because they know that others have found it helpful. If you need help constructing your cover, 48 Hour Books has a Create-a-Cover option for $100. With this option, you can choose a general layout, a background color and texture, and any additional instructions and photos you want included. Email all the photos to us, and our prepress technicians take your options and assemble your cover using these elements. The $100 is a one-time fee, so if you receive your cover proof and decide you want to change an element on it such as the background color, this is no problem. If you have InDesign, you can use one of our Cover Templates to design your own cover. When writing your book, there are different approaches you can take when it comes to organizing the material. As mentioned above, once you've arrived at a format, be sure to keep it consistent throughout the book. It may help to go to your local library and glance through other books in your category to get some design or formatting ideas. Remember the saying: "imitation is the highest form of flattery." You can't copy another author's words, but you can copy their structure or basic design. -- A FREE Self-publishing guide! We make it easy to self publish, with help from start to finish. We've helped thousands of self-publishers just like you. We've got lots of helpful information on our website, or just give us a call. We're happy to answer all of your questions over the phone. Whether you're new to self publishing, or you're an expert self publisher with several titles already in print, we can help get your books printed fast. Once you're finished writing your book, you may wonder, "What do I do now?" Not to worry! Below we've outlined some steps to take that will get you started in the self-publishing process! Don't forget to proofread your book before you send it to us for printing! The best way to keep your costs low is to proofread carefully at every step. Your costs start to increase if we have to go back and forth with multiple revisions of your files. Try to give us trouble-free "ready-to-print" files from the beginning. We recommend reading and re-reading your book until you can't stand it any more ... and then reading it some more. Find family members or friends who are willing to look through your book for typos or grammatical errors. You can even hire someone to do the proofreading and editing for you if you'd like. Editing your book is perhaps the most tedious part of the self-publishing process, but trust us, you'll be glad you did it! There's nothing worse than holding your finished book in your hands and realizing there's a misspelling on the first page. Here is an example of an ISBN. It's just a 13-digit number. You may be wondering: What exactly is an ISBN? An ISBN is a unique number that identifies a book. Many books have the same or similar titles, so bookstores and book distributors use an ISBN to be sure they're ordering the correct book. If your book doesn't have an ISBN, bookstores (including online bookstores) won't carry it. Each version of the book (paperback, hard cover, ePub, MOBI, PDF, audiobook, etc.) has it's own unique ISBN. So you might need 4 or 5 ISBNs just for one of your titles. That's why it's best to order your ISBNs in blocks of 10, 100, or even 1,000. Keep in mind that once these numbers are assigned, they cannot be re-used. 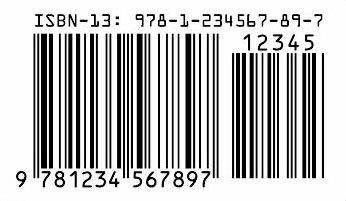 Here is an example of a Barcode, which we generate from the ISBN. To make it simple? An ISBN is like a serial number that identifies the publisher, author, and title of a book (as well as other information). More than likely, you'll need an ISBN if you plan on selling your book (and you'll definitely need one if you plan on selling it in bookstores). An ISBN is not the same as a bar code, although the ISBN is used to create a bar code. You must have an ISBN if you want a bar code on your book. (A bar code is like a price tag; it's the graphic with vertical lines that gets scanned whenever an item is purchased). If you'd like to add ISBNs and Barcodes to your order, simply download our ISBN Application Form (USA), fill it out, and email it back to us. (This is only for the United States and its territories. Canadian customers should get their ISBN through CollectionsCanada). Be sure to tell us in the "Comments" section of your order form, so we know to put the barcode on your book cover. And don't approve your book cover if it doesn't have your barcode. If you do, we'll print your books without a barcode. If that happens, the best we can do is to print barcode labels that you can affix to each book. If you already have your ISBN, we can provide you with a bar code for $20 if you tell us your ISBN. What exactly is a copyright? According to the Library of Congress, your work is under copyright protection the moment it is created and fixed in a tangible form that it is perceptible either directly or with the aid of a machine or device. Basically, once you've written your book, you are automatically the copyright holder. However, you will have to register with the Library of Congress if you want to be able to file a lawsuit based on the infringement of your work (if you want your copyright to hold up in a court). It can take several months for a copyright application to be approved, so we recommend researching this as early as possible! Many authors do choose to get their book printed while they are waiting to hear back from the copyright office. All of this information and more can be found on www.loc.gov. Next you'll need to decide how you want your book to look. What size do you want it to be? You may want to visit libraries or bookstores to get an idea of what size books similar to yours usually are. We have four standard sizes available (4.25 x 7 inches, 5.5 x 8.5 inches, 6 x 9 inches, and 8.5 x 11 inches) but we are able to trim to almost any custom size (we can even print books as large as 12 x 12 inches)! Design the cover yourself: You can create your cover in three separate pieces (front, back, and spine) or in one piece that will wrap around the entire book. Choose whichever method is easiest for you! We have some helpful information about what size you'll need to make your cover in the "Before I Place My Order" section of our Frequently Asked Questions (FAQ) page. Of course, if you have questions or need some guidance, you can always give us a call and one of our techs can help! Choose our Create-a-Cover service: Our Create-a-Cover is an inexpensive option that lets you select the basic look of your cover. Then you upload whatever photos or artwork you'd like included, and we'll put everything together to make a professional book cover at a fraction of the cost. Check out more information about our $100 Create-a-Cover service. Hire a graphic designer: This is the best option if you're not able to design the cover on your own but have something complex in mind for your cover. A local graphic designer can work with you one on one to make your book cover look exactly how you want. Once the design work is done, and you're sure that your pages are the proper size, make sure all of your files are print-ready. We require PDF files for printing, so you'll want to convert your document into that format. You can convert your files to PDF by choosing “File > Save as PDF" if your computer offers that option. If you don't see that option, you can try downloading our free PDF converter). Or, if you're a new self-publisher and don't want to mess with it, just send us your Word files and we'll convert them for you for $50. After you save your file as a PDF, be sure to check the PDF file CAREFULLY before sending it to us for printing. Any errors on your PDF will show up on all of your books. Your book cover can be in PDF format or can be saved as a .jpg, .jpeg, .jpe, .gif, .png, .tif, .tiff, .bmp, or .eps file. Finally, a simple step! Our Cost Calculator makes it easy to determine how much printing and binding your book will cost. Fill out the cost calculator, and if you're ready to place an order, simply click the big red button. Our online ordering is fast and easy ... of course, if you have any problems you can give our customer service reps a call and they'll be happy to walk you through the process! After your order is placed you'll be prompted to upload your files directly to your order. We will send you PDF proofs of your files to review before we print your books. This is your absolute last chance to catch anything that you want to change before we print your books. Remember, we are book printers; all of your proofreading and editing should already be done long before you send us your files. However, we know the editing process is never truly over, so we like to give you a chance to triple-check your work. Rule #1: Never sign off on a proof if it is not correct. Rule #2: Never assume anything. Open your files and proofread them CAREFULLY. They should open in Adobe Acrobat or the free Acrobat Reader. Please pay special attention to make sure everything is exactly the way you want it. If something doesn't look right, contact us. ZOOM IN to see fine detail and to make sure the layout and fonts are correct. PHOTOS and ARTWORK: If you're not sure if your photos are high resolution, we recommend viewing them at 200%. If your photos look rough at 200% on your screen, they'll probably be rough when they're printed in your book. PAGE SIZE: Make sure the page size is correct. COLOR MATCHING: Don't trust a PDF proof for color matching. There are big differences between a computer monitor and a printed piece. If you've got colors that you want to match, either send us a printed sample and we'll try to match it, or get a Printed Proof of your book and make sure the color is right. Make sure the book is EXACTLY the way you want it. When you sign-off, you're telling us to print EXACTLY like the PDF proof. READY TO SIGN-OFF? When you are finished proofreading, log into your 48HrBooks account, click on the "Signoff" link, and either "Approve" or "Reject" your proofs. But please remember, once you sign off, your books go into print. You won't be able to make any more changes. Step 8: We Print Your Books! Once you sign off on your proofs, we'll start printing and binding your books! Now all you'll need to do is wait (this may be the toughest part of all)! Here is where the "48HrBooks" clock starts ticking. Keep in mind, we don't count Saturdays, Sundays or Holidays, and each day's cut-off is 5:00 pm EST for Standard Production, 3pm EST for Rush, and noon EST for SuperRush. Any approvals after these cut-off times will be counted as the following day. Example: If you OK your proof Monday at 4:45 pm EST, your books will ship Wednesday. But if you wait 20 minutes longer and don't OK your proof until 5:05 pm EST on Monday, the approval will be counted as Tuesday, so your books won't ship until Thursday. Perfect bound books will ship in 2 days, coil and casebound books will ship in 5 days. Don't forget to add shipping time! Our standard shipping method is UPS Ground from Akron, Ohio so keep in mind that it may take several days for your books to ship. Be sure to contact us if you have a specific need-by date and our customer service reps will work with you to find the most cost-effective way to get you your books on time! Make use of social media. It may seem like a no-brainer, but promoting your book on social media such as Facebook, Twitter, and Pinterest will be your most inexpensive and possibly your most effective method of getting the word out about your book. Be sure to share the info with friends, family members, and other acquaintances. Who knows? You may know someone who knows someone who will want to help sell your book! Contact bookstores. You may have better luck with smaller, local bookstores, but it never hurts to ask every store possible. See if stores in your area will sell your book and research what needs to be done to get your book into larger chain bookstores. Don't forget college bookstores! Set up book signings and release parties to get the word out! Nothing gets people more excited than a party (HINT: especially if there is food involved). Set up flyers advertising your book signing or release party around town and make sure you'll have plenty of copies ready to sell the day of your event! Sell your book online. 48 Hour Books can ship books directly to Amazon if you provide us with shipping labels (you will need to coordinate this with Amazon ahead of time). See if other online booksellers will put your book up for sale as well! It also never hurts to have a website dedicated to your book. On your website, post information about you and about the book ... including how to contact you to purchase a copy. That way, if someone is searching for your book online, they'll have a resource available with all of the information they'll need to know. Hire a marketing or distribution team. While we don't have any recommendations at this time for specific companies, we know there are a lot of highly qualified marketing consultants or distributors out there who can help! Hiring professionals may save you a lot of time and effort if you're willing to pay for the help. Do some research online for book marketing and you'll be amazed by the amount of information that is available! Your Book and 48 Hour Books -- A Great Publishing Team! Call our self-help book publishers during normal business hours (Mon-Fri, 8:30 am - 5 pm EST) at 800-231-0521, email us anytime at info@48hrbooks.com, or check our website, www.48HrBooks.com to learn how to print a self help book.